After a fantastic Mexican meal in Ponsonby, Mrs. Best Beer HQ wanted to grab some ice cream for dessert on the walk home. Seizing the opportunity to try a new craft beer, I opted for a can of Garage Project’s White Mischief salted white peach sour instead. I mean, it certainly sounds like a delicious dessert beer, doesn’t it? Let’s find out. The White Mischief can: I’ve stopped describing what’s on the beer bottle or can in my reviews because, well, you’ve got eyes; you can see it for yourself in the picture above. But what you might not be able to make out this time is what those two naughty little rabbits are doing to each other on the White Mischief can. Let’s just say Bugs Bunny would be horrified… or very turned on right now. Blurb about the beer: Kettle soured wheat, lightly salted and infused with white peaches – a delicate three way salty, sweet and sour balancing act. A little bit of white mischief in a beer where anything gose. Brewed for Burger Wellington 2015. Tastes like: So Garage Project does know what peach tastes like! Last week I reviewed their Angry Peaches APA and made the point that I couldn’t detect much (or any) peach in it. This week, White Mischief positively smacks of the stone fruit. Oh yes, the peach is very strong in this one – overly so, in my opinion. Like a person you’ve just met who’s trying way too hard to make a good first impression, the peach just comes across as a little bit obnoxious. Like, enough already – chill out; if I wanted peach, I’d eat one. But then it finally seems to settle down after a while, or I just get used to it, and then I can at least appreciate the underlying beer. That’s not to say that I necessarily hate this beer. On the contrary, White Mischief is a decent enough summery concoction – sweet with a tart finish, and a subtly metallic aftertaste (I’m drinking it straight from the can) – that’ll certainly appeal to some people. Just not me. I guess I don’t like peach that much. Is it the best beer ever? 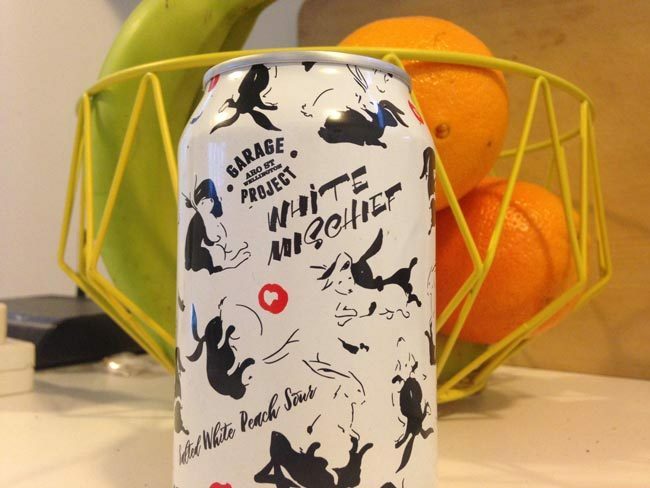 If peach is your favourite fruit, then Garage Project’s White Mischief salted white peach sour could very well be your new favourite beer. For me, though, I’d probably prefer every other sour beer that I’ve tried so far – including the equally fruity Good George Blueberry Sour, and 8 Wired’s Hippy Berliner cucumber sour (even though I enjoy cucumber about as much as I enjoy peach, that beer just works better than this one for some reason).